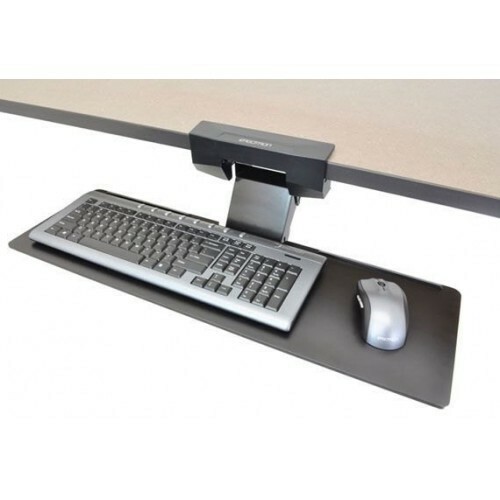 This keyboard tray is attached underneath the desk and allows you to position your keyboard and mouse in their ergonomically correct position to enhance comfort and productivity. The 3M™AKT180LE Keyboard Tray helps to place your keyboard and mouse at proper level to increase comfort and productivity. AKT180LE has an sit/stand easy adjust arm – just tilt platform, adjust and release to lock in place. Adjusts height to 255 mm above the mounting surface and 100 mm below the mounting surface allowing you to alternate between sitting and standing positions. Tilt is adjusted by dialing the tilt knob to the desired angle. The sturdy platform has proprietary lateral adjustments for getting the keyboard exactly where you want it. The articulating mousing platform adjusts in all directions, tilts forward and back, and can be mounted on the right or left side of the keyboard platform. Includes leatherette gel wrist rest with antimicrobial product protection for keyboard and mouse and Precise™ Mouse Pad.